"Perfect for a buffet or a barbecue. Customize with your favorite vegetables." Combine all ingredients except Wish-Bone(R) Italian Dressing in large bowl. Add Dressing; toss well. Serve chilled or at room temperature. NOTE: If preparing a day ahead, refrigerate, then stir in 1/4 cup additional Wish-Bone Dressing before serving. 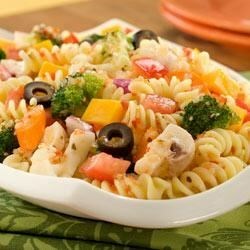 For a Creamy Italian Pasta Salad, substitute 1/2 cup Hellmann's® or Best Foods® Real Mayonnaise for 1/2 cup Wish-Bone® Italian Dressing. Also terrific with Wish-Bone ® Robusto Italian, Fat Free! Italian, House Italian, Ranch, Light Ranch, Fat Free! Ranch, Creamy Caesar, Red Wine Vinaigrette or Fat Free! Red Wine Vinaigrette Dressings. It was okay, but there was a tinny flavor that I think came from the commercial dressing. I like the mix of ingredients, so I'll try it next time with homemade dressing. I used half Wish-bone Italian dressing and half mayonnaise, as suggested in the footnotes. We liked the creamy texture and subtle taste. This was great. I used bow-tie noodles, broccoli, yellow and red tomatos, green pepper and cucumbers. I use canned green beans (drained), sliced black olives, sliced green olives, diced red onion, celery and grape tomatoes, with italian dressing. We love it!